I’m not saying that all doctors take nurses for granted (which isn’t true) but there is truth underneath that. Nurses are often under appreciated. Especially, in my opinion, hospice nurses. Hospice nurses (also called end of care or palliative nurses) take care of anyone who can’t take care of themselves because of a terminal or chronic illness. But there are several types of hospice nurses. Admissions nurses are there from the start, usually the first one the patient will come in contact with. Triage nurses are like on call doctors, constantly ready to spring into action in case of an emergency. While I was doing my research, I came across types of hospice nurses I didn’t think about. When we hear hospice, we think about the 80 and 90 year olds who have lived their lives and gotten married and traveled the world and had kids. But pediatric and perinatal hospice is something I never thought about. Pediatric nurses focus on children, helping them bear the masks, needles and perhaps the lack of understanding of what’s really long with them. But they are not there to care for the child, but for the parents and family, helping through the physical, emotional and psychological toll. Perinatal nurses are different from pediatric nurses but have sometimes overlapping areas of expertise. They focus on taking care of pregnant women who have chronic or terminal illness who are preparing to give birth. Or women who are preparing to give birth to children who won’t live long. 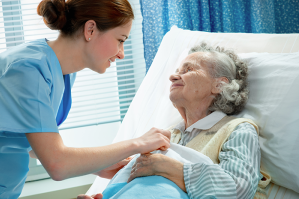 In order to be a hospice nurse, empathy, dignity and integrity which are required in order to carry out the job. Not to mention the physical requirements that are needed in order to help the patient in whatever way. Hospice nurses are also reported to have high levels of anxiety, depression and other notable negative health outcomes. They are underappreciated for the working in the environment that they do and taking on the same (or similar) mental and physical toll everyday. Nurses are underrated and (as someone had said) are ‘at the front lines’ but hospice nurses still remain unnoticed in daily life. It takes an incredible about of dignity and fortitude in order to be en end of life nurse, something of which we can all learn from.